Well, the Summer Fair a week ago was a really enjoyable affair, lovely people showing their wares and lovely people coming to praise or buy. 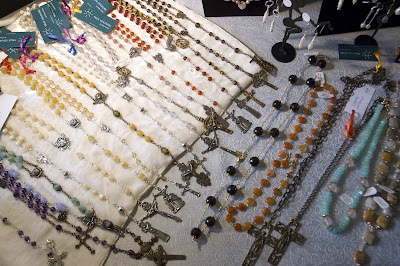 I thoroughly enjoyed it, and once again a lot of interest was shown in my rainbow of rosaries. I use lovely handpainted rainbow ribbon to attach my swing tags. I've had five long days of conferences in the meantime so I am only getting to post something now. 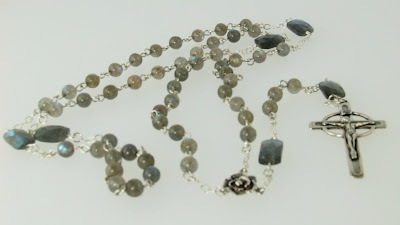 My lovely labradorite and silver rosary went within the first hour, my one-decade amethyst and silver penal rosary in the second hour, and as I was about to sell it to one gentleman I noticed another lady preparing to pick it up, so she has commissioned a similar one. 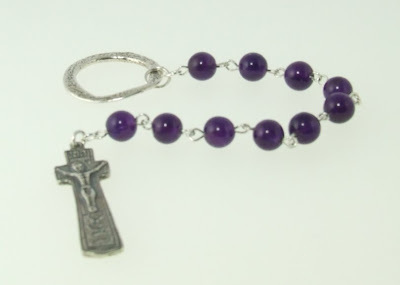 I hope to add some of the newer rosaries to my Artfire shop tomorrow.